Apache Native Americans are a group of six different tribes that live in the South Western regions of the United States. They are excellent hunters and their traditional survival skills have been passed down through many generations. Although there are fewer Apaches today (2015), before the wars in 1800’s they were a thriving group. The Apaches developed many kind of traps for wild animals, fish and birds. For example like the deadfall trap where a heavy log that falls on to the prey. Or another, where sharp pointed wooden arrows are coiled to shoot an animal when it step into a trap, and many other good practical traps. One of the trap that was commonly used, is the Apache foot trap which is used for big game hunting, and this article details what it is, how to make it and how best to use it. The Apache Foot Trap is designed to catch small and large animals. This simple trap snare animals for a plentiful food supply, but without a great deal of energy being used by the hunter. 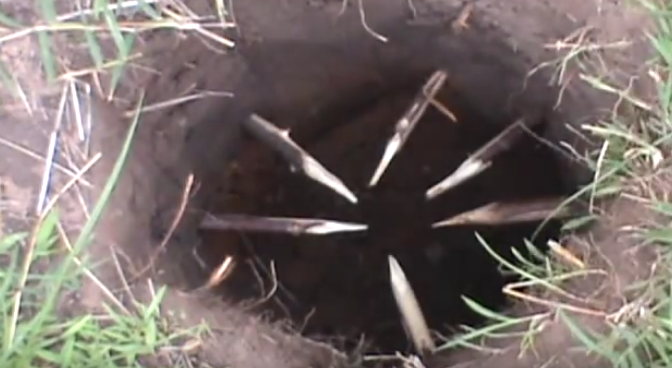 It is designed to trap the animal’s foot in a hole with many sharp wooden stakes (sticks). The trap can be modified for smaller animals such as racoons and foxes, but is usually used to trap deer. To make an Apache Foot Trap, first dig a hole in the ground. It needs to be wide enough and deep enough to hold the animal you are trying to capture. Holes need to be at least 12 inches deep. Approximately 9 inches from the bottom of the hole, insert wooden stakes horizontally into the sides. It should have been carved into sharp points at one end, and these pointy ends should face inwards. A small circle should be formed by the points, this is where the leg of the animal will get trapped. To secure the animal, a loop of rope or cord is tied into a slipknot at one end and laid over this circle, with the other end tied to a tree for support. Finally, leaves or twigs are used to cover over the trap. The unsuspecting prey walks over the trap and falls down when the camouflage gives way. A leg is trapped, and as the animal struggles free the rope loop tightens around their leg, making it impossible to get away. This can result in damage to the leg, as such, modern survivalists recommend that these traps are only used in extreme survival situations, not practised as hobbies. While waiting for the trap to be sprung, the survivalist is free to forage for other food, collect water or build shelter. Alternatively, you can set a few of these traps up, to protect yourself from wild animals when you are asleep at night. Some hunters like to build the trap in a funnel shape, narrowing at the top. Others use more than one row of sticks. The hole can be dug in any patch of ground, do not worry if the hole becomes waterlogged as that can aid in camouflaging it. Care should be taken when building a foot trap. Because it is camouflaged, it is all too easy to accidentally trap a human, rather than an animal. Survivalists need to be aware of the laws on hunting big game in their locale. If a deer is trapped by accident somewhere laws prevent them being hunted, set it free immediately. If the animal is injured, report the accident to the local authorities. An Apache Foot Trap should be used with extreme caution and only during a survival situation. While it is an excellent survival skill to learn, it can be dangerous to use in modern times. What Can Native American Culture Teach Us about Survival and Family Values?